Machine safety warning labels are designed to protect your company’s employees, inventory and workplace. Danger labels and other OSHA and ANSI approved signage provide colorful, clear and easy to understand danger warnings for a wide range of equipment, machines and hazardous areas. Machine safety labels and danger labels are also ideal for marking company assets, organizing inventory, and marking items for maintenance or repair. OSHA (Occupational Safety and Health Administration) and ANSI (American National Standards Institute) compliant safety labels help you identify employees and visitors, comply with safety regulations, warn employees about potential hazards, which promotes a safer overall workplace. ANSI-ISO compliant labels ensure that machines and equipment manufactured for use internationally have warning symbols that can be easily understood even though the language the label is written in may be different. OSHA and ANSI compliant safety labels are available in a wide variety of colors, sizes, and messages. These specific machine safety labels allow your business to promote safety throughout your entire facility while remaining in compliance with regulations. Our OSHA and ANSI safety labels can be displayed in many places, on machinery and equipment, and in potentially dangerous areas. Steer clear of hazardous areas - Inform users of alternate routes when they might otherwise walk through an area littered with heavy-duty machinery, slippery surfaces, and other dangers. Avoid congestion - The more users crowd an area, the more likely they are to encounter (or create) hazards. Help users avoid congested areas and use wayfinding to create safer routes. Help workers in emergencies - Wayfinding can send users to fire exits, outline emergency egress routes, and clearly point out fire extinguishers and other lifesaving equipment during emergencies. Equipment requires routine maintenance, service, inspection, and repair. The following types of machine safety warning labels can help workers stay safe around equipment in need of service. Lockout/Tagout - Lets employees know when certain machines require lockout/tagout (LO/TO) before servicing and inform employees when a LO/TO procedure is being performed. Instructions - Reminds employees to shut machines off before servicing, check fuel or oil levels, and read directions before starting work. Specific hazards - Warns employees about a machine’s unique hazards (such as the dangers posed by moving parts, high air pressure, and oil pressure) so they can take the appropriate steps before starting work. 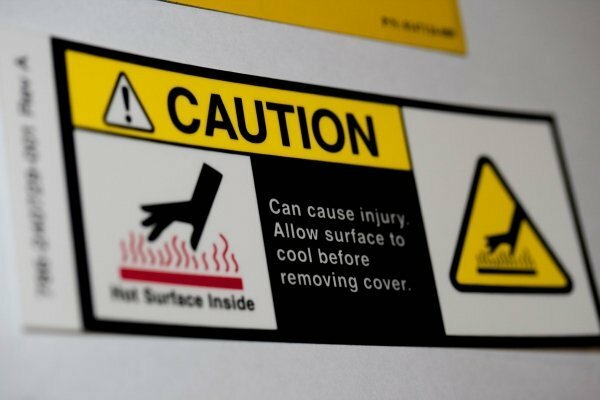 Custom machine safety warning decals can be created to fully customize your specific machine or safety requirements. There are certain safety label conditions that must be adhered to for full OSHA and ANSI compliance. By utilizing our custom machine label processes, we can create safety and danger labels that keep your employees and customers safe while meeting all OSHA and NASI conditions. Our custom machine safety labels allow you to choose from hundreds of options in a variety of colors and variations such as decals made of tamper evident materials or labels that can withstand harsh environments. Contact us for more information regarding our machine safety warning labels and OSHA/ANSI compliant danger labels, or request a quote today for an in-depth price analysis.